Flotation itself has been shown to lower blood pressure, pulse, and a host of stress hormones in the brain. Lying in the tank, you are buoyed up by 800 pounds of epsom salts dissolved in 10 inches of warm water, heated to body temperature. The tank has a lightweight door at one end and an air circulation system at the other. 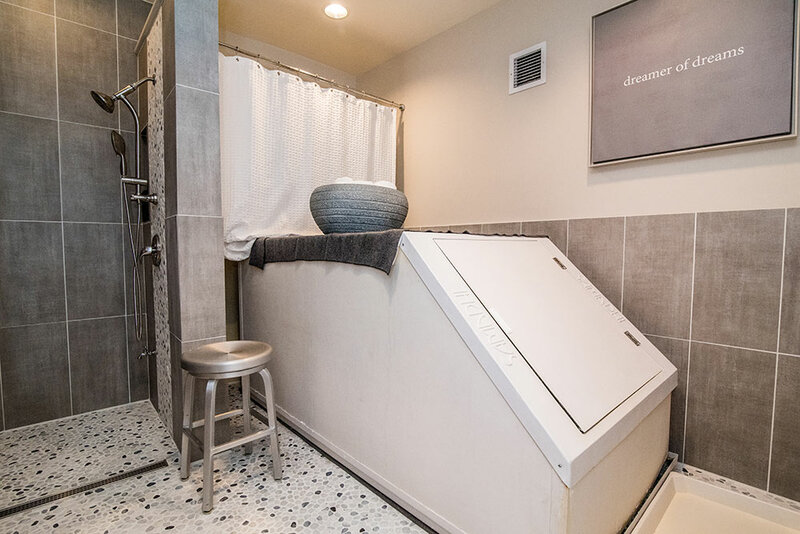 The absence of sensory stimulation in the tank allows for profound relaxation and the salt in the water provides a highly effective means of detoxification. The tank can provide a pleasant respite from fatigue and sensory overload. The tank reduces the stimuli of the outside world so the body and mind can relax. Each experience is different and different people have different experiences. The person in the tank has total control. The door may be left open or closed, the head can be to either end of the tank, the tank is completely safe. One may fall asleep safely in the tank. The salt in the water buoys up the body and also pulls impurities from the skin to the surface where they are either dissolved or washed off. Flotation itself has been shown to lower blood pressure, pulse, and a host of stress hormones in the brain. Potent relaxation increases alpha and theta waves. Many people report a relaxing, weightless experience where they can explore their own consciousness/creativity or contemplate specific questions. Some feel a sense of freedom, peace, and detachment. Flotation may also help relieve pain and muscle aches. Research indicates that the body's pH and electrolyte levels become balanced. In effect, the water massages and strengthens the nervous, endocrine, and musculo-skeletal systems. Feelings of peace and well-being result from the decrease of stress hormones and the utterly profound relaxation from the lack of sensory stimuli. Recommendations: For those experiencing moderate to severe stress levels and/or symptoms, Dr. Jordan recommends 5 to 10 treatments at a frequency of 2 per week for the first 2 weeks and then 1 per week until the symptoms are resolved. After that, 1 session every 4 to 6 weeks (or as necessary) is appropriate to maintain the acquired state of well being. For general relaxation and stress relief, one session per week for 2 weeks is recommended, with a follow-up of 1 session every 4 to 6 weeks. Dr. Jordan recommends scheduling at least 3 sessions to truly experience the benefits since the general experience is that it takes a session or 2 just to become accustomed to being in the tank before achieving a deeply relaxed state. The above recommendations are for anyone serious about following Dr. Jordan's protocol for healing. Flotation Tank sessions last 60 minutes and are currently on sale for $60 each (regular price $80). Please contact the Optimal Wellness Center for current introductory and package specials for the flotation tank.Call 216.521.2225 or visit the Front Desk to purchase and schedule your Flotation Tank package.